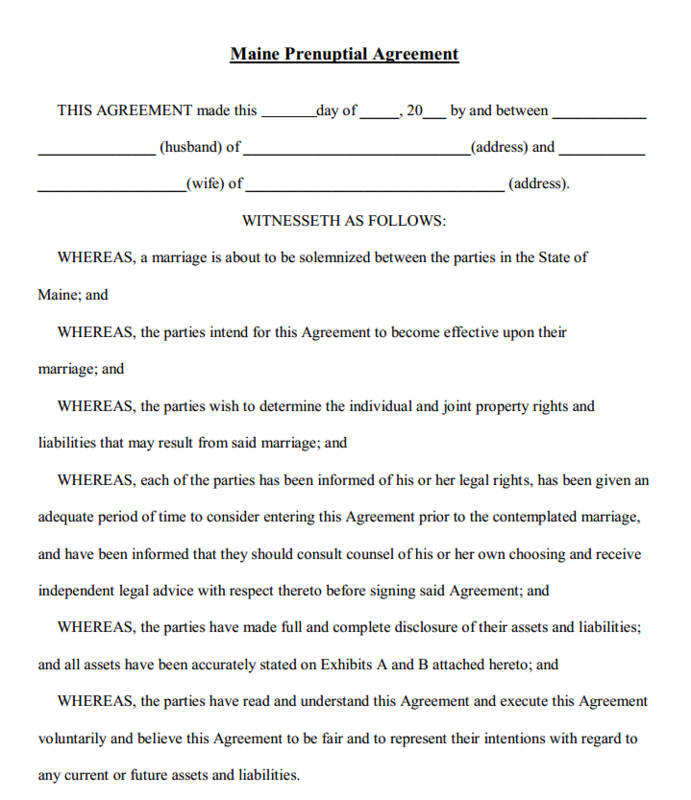 This form is a Prenuptial Agreement applicable in the State of Maine. Download this template by clock on the link at the bottom of this page. A Prenuptial agreement is an agreement made between couples before their marriage. The agreement deals with the details of the ownership of their respective assets if the marriage fails. The agreement lets the couple make an acknowledgement of no claim, i.e. they make no claim on each other’s estate in the event of the marriage terminating. The clause applies even if the marriage hasn’t been solemnized. The second clause of the agreement is a separate property clause which lets the couple keep their estate separate post solemnization of the marriage. This applies to the property that is acquired after the marriage. Though it does not apply to any property acquired as joint tenants by the couple. The Fourth Clause relates to the Earnings of the Couple during the marriage, it states that the earnings of the couple during the marriage will be considered separate property, except for the obligations to support their minor children. The fifth clause of this template is related to Contributions and Accumulation in Retirement Plans, stating that all retirement plans in the name of each individual will remain separate property. Clause six deals with Obligations and Debts, stating that each individual’s obligations and debts are their separate properties and in the event of a divorce each individual will be fully responsible for those obligations and debts. Clause seven states that each party’s tax obligations shall be satisfied by each party separately. Clause eight states that even if the financial circumstances of any party changes relating to income and estate shall not have any bearing / effect on this agreement. The ninth clause states that if the couple become biological or adoptive parents or guardians of a minor, it will not affect any change in this agreement, except that which requires to support the minor. Clause ten deals with Property shared in the event of a divorce, all property held in the individual’s name shall remain separate, and all other properties shall be construed as per the documentation of those properties. The rest of the Maine Prenuptial Agreement deals with similar clauses related to Wills, Property Transfers, Disclosure, and Fairness etc. The agreement has to be witnessed by at least two people and signed in front of a Notary Public in the state of Maine.